Gorgeous, intelligent, and tender, the staple of the band shows all the merit of a true leader. Dyza Greene is a powerful ally, and a charming musician. The Lovely guitarist of the Harbingers formed her jug band to promote a sense of wandering community, entertainment, and joy to the survivors of the Fall. 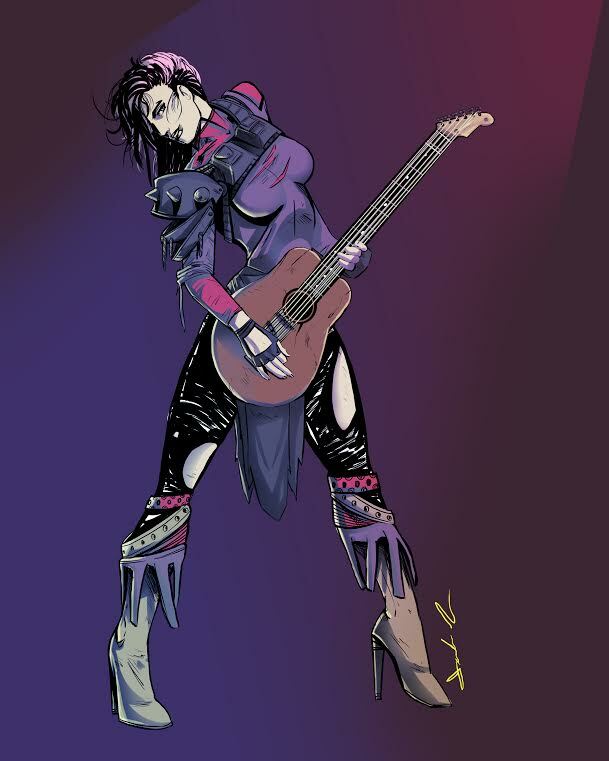 She prides her new family of misfits in all that they do, and with the band’s matriarch, Rossie Perth as her guide and mentor, inspires others to embrace music as a beacon in the bleak world. Though she is the youngest of the band, she is easily one of the most cunning. A guitar isn’t the only thing the ex Freedom Fighter can shred. While all band members have selected a docile, unifying profession, they are all survivors at heart, and Miss Greene is a skilled tactician capable of picking apart enemy defenses.